All Blacks legend Jonah Lomu looks set to require another kidney transplant after being admitted to hospital over a week ago. Lomu received a kidney transplant back in 2004 but after being re-admitted to hospital with renewed trouble, the legend concedes his kidney needs to "fight." 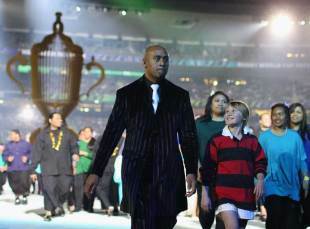 Lomu took part in the opening ceremony of the current World Cup but he has since developed a life-threatening condition. "It just went pear-shaped one afternoon," Lomu told the New Zealand Woman's Weekly. "I thought it was just a cold or food poisoning. I couldn't put my finger on it. All I knew was that I didn't feel well and I couldn't hold any food down for about 10 days. I was basically starving." "Last Friday, the 23rd (of September), I was just about to leave for a function and I crashed. My kidney was failing and my body had become so toxic it started to shut down. "My kidney needs a rest, then it needs to wake up and start working. It needs to fight." And wife Nadene says they are waiting on tests to determine the next step in his recovery. "They've said there's a very slim chance this kidney may survive," Nadene said. "So for now Jonah's having dialysis every day and a load of other treatments to see if it can be revived." Lomu originally received a kidney from DJ friend Grant Kereama and has built a new life in France but the legend will have to wait on his health before making any return to Marseille. "Our lives have been put on hold," Lomu said. "We were going to go back to France in December, but nothing's going to happen until this is sorted out." Meanwhile it has emerged that another former All Blacks international is in hospital with kidney issues. Joeli Vidiri - who was forced to retire from rugby in 2001 after being diagnosed with a kidney disease -was admitted last Sunday for a check-up. Vidiri told the Herald on Sunday: "Life is not that long, (Jonah) has to be happy with his life and do what he loves but I want to say to him to take it easy and go step-by-step, day-by-day."